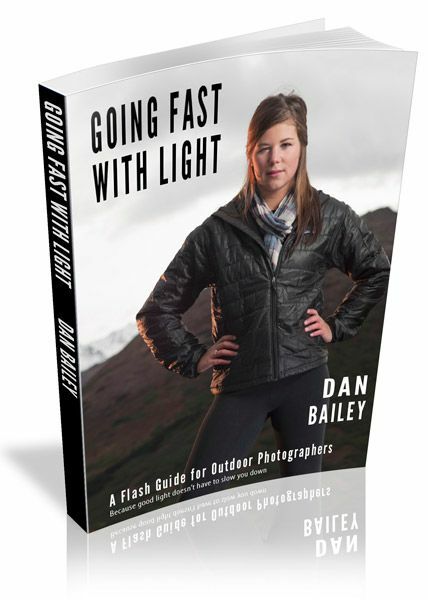 Going Fast With Light, written by pro photographer Dan Bailey, is an 83-page manual that will show you how to use off-camera flash and apply strobist-style lighting techniques in your active outdoor photography styles. Two realities that outdoor photographers often face are that the best light is often the most challenging light to work with, and that the most compelling subjects are not always lit by the best light. Having some control over the light can make all the difference. Successful photographers know that the subtle use of flash can really transform a photo int a great image. However, some outdoor shooters don’t use lighting gear in their photography because they’re either intimidated by using flash or because they think the equipment is simply too heavy or too cumbersome. Going Fast With Light will show you that good light doesn’t have to slow you down. In this book, you’ll see specific flash gear and light modifiers that are both affordable and easy to pack, as well as techniques that will help you dramatically improve the quality of your imagery. You’ll learn different lighting schemes using a single flash or multiple flashes, which methods work best for triggering off camera remote flashes and see a number of lightweight lighting rights that you can adapt and use in your own work, depending on your style. You’ll see how to effectively use colored light without having it look too obvious and learn how to take your photography to the next level of creativity, style and professionalism. Whether you shoot action, adventure, sports, travel, portraits or kids playing in the backyard, this book will change your photography. With nearly 100 images and over 20,000 words of text, this practical manual contains a tremendous amount of information and ideas that is sure to inspire your creativity and advance your skills and confidence with off-camera flash. Horizontally formatted, it's optimized for your computer and laptop monitor, and it looks simply awesome on the iPad. Going Fast With Light: 83 pages. Download it today, get yourself on a new creative path with your photography and see why good light doesn't have to slow you down.